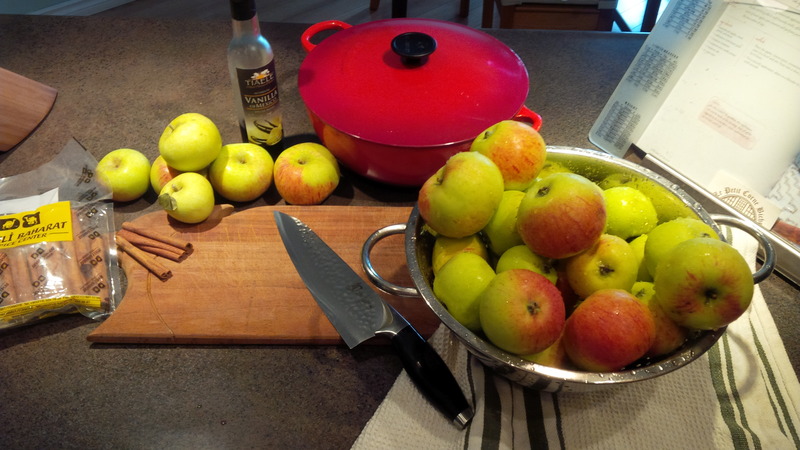 Apples, Apples and MORE Apples – what to do with all those apples??? When we moved into the house in mid-summer, I was so ecstatic to find out we had a producing apple tree in the backyard. I had no idea (still don’t) what kind of apples it would give us. I was assuming they would be crab apples and I would be able to make some grab apple jelly, which excited me. However, in speaking to one of our neighbors they advised us that the apples that the tree produced were quite big and were pretty good eating apples (happy, happy, joy, joy – I think I actually did the dance). They proceeded to tell us that the previous owners didn’t use the apples and that they picked enough last year to make 16 apple pies. When the tree first started to drop apples – meaning when they were ripe and it was time to start harvesting, I thought, oh there aren’t that many, I don’t want to give them away – I couldn’t have been more WRONG!! It gave us five (5) boxes full like the one above and there were at least 2 more boxes that had to be composted due to rotting, birds pecking at them or worms making homes in them….ewww! I made one batch of applesauce, then another and another. By this time I was more than ready to give away apples 🙂 We bagged up about 20 lbs for the neighbors and gladly and a little proudly dropped them off. I also gave about another 7 lbs to a work colleague (note – I take the train to work and have to walk a good distance, so I could only carry about 7lbs at a time). She also made applesauce and sent me this picture. I love this picture. I am ever so hopeful that my Christmas gift recipients like apples…lol- because I think homemade applesauce and apple pie filling is A Wandaful Thing!!! 2 Responses to Apples, Apples and MORE Apples – what to do with all those apples?? ?